Yesterday’s election represents a watershed moment in the life and history of our country. 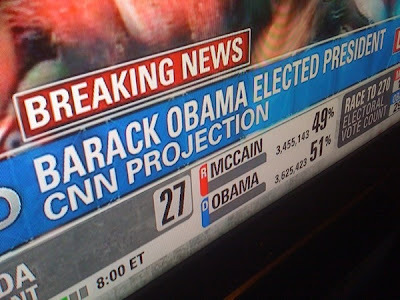 Regardless of how you voted, our entire nation can celebrate the milestone of our first African-American president. We can all embrace this profound opportunity for deeper racial reconciliation and social justice. But this is also a moment that demands prophetic leadership and the power of a faith-inspired movement. From the abolition of slavery, to women's suffrage, to civil rights, history shows us that political change happens when social movements push on open doors of political leadership. And the best movements have spiritual foundations. This election represents a new and open door for change. However, we know that President Obama will face tremendous pressure and obstacles in pursuing an agenda that addresses the moral imperatives to overcome poverty, develop renewable energy, responsibly withdraw from Iraq, and dramatically reduce the number of abortions. That is why your commitment is needed now more than ever. We must ensure that the campaign slogan of “change” becomes a new movement for change. We will deliver your pledge to President-elect Obama and his team, with the message that the faith community will be mobilizing both in support of him and to hold him accountable. Sojourners will start with President Obama’s own pledge to mobilize our nation to cut poverty in half in America over ten years and provide the leadership necessary to achieve the Millennium Development Goals to cut extreme global poverty in half by 2015. In recent times, religion has been both too narrow and too divisive. The faith community can now play a new role—bringing people together on the biggest moral issues of our time—even across old political divisions. This election has shown that the era of single-issue voting is over and a broader moral agenda that seeks common ground on moral issues has begun. Members of Black churches, Catholics, evangelicals, Latinos, and mainline Protestants are acting on a broad set of biblical values. I look forward to the day when both poverty reduction and abortion reduction become nonpartisan issues and bipartisan causes. We have decided to be committed to praying for President-elect and soon President Barack Obama. Will you join us?